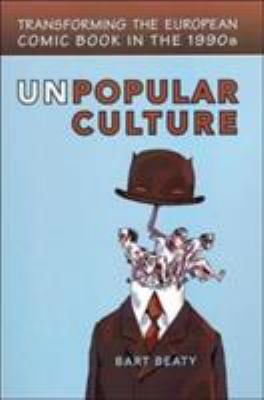 Unpopular Culture: Transforming the European Comic Book in the 1990s is a book about a certain aspect of the comics scene in Europe as it developed in the 90s and 2000s. Bart Beaty, a communications professor at the University of Calgary, has a catholic approach--he deals with his subject from a historical standpoint, as objects of criticism, as economic actors, etc. But I was reminded as I read what Thomas McEvilley told us on the first day of class in "Film Form." He said that he was teaching "the art history of film history." That isn't quite what Beaty does, but he approaches it. Beaty frames his discussion on these comics around the work of Pierre Bourdieu, a French sociologist who wrote what sounds like very interesting things about how art enters culture. I was utter unfamiliar with Bourdieu before reading this book (I made a conscious choice to stop reading difficult French theory about 20 years ago, but Beaty has got me interested again, damn him!). Take for example this sentence: "Bourdieu has noted that it is the publisher, promoter, or agent who is the creator of value, not the artist." This is by way of justifying Beaty's concentration on particular publishers as well as artists, whereas a "pure" art history of comics would do no such thing. But it feels right. Economist Don Thompson came to the equivalent conclusion in his book The $12 Million Stuffed Shark--he reached his version of this idea empirically. But there was another reason this statement struck me--it comes from my time as an editor at Fantagraphics Books. This was during the early 90s, and as an editor there, I had the powerful feeling that we were on the vanguard of comics, that we were creating a conceptual space for comics as art through our publication of The Comics Journal and through the artists we chose to publish. I'm sure the guys at L'Association or Fremok (two of the publishers Beaty writes about) feel the same. This said, the basic idea presented here is that there are two "principles" that art may exist in, the autonomous (prestige is accorded to artists by other artists) and heteronomous (where quality is judged by sales or performance within the market). The comics Beaty is looking at are more-or-less governed by the autonomous principle. This seems like a really old, really trivial idea, and not particularly interesting. It's the difference between art-for-arts-sake and selling out, between integrity and stardom, between being an artists' artist and being a people's artist. But when combined with the notion mentioned above--that editors and agents and publishers are the determiners of value--the difference becomes more complex. Because as soon as an editor (or gallery owner) decides to take a chance on you, success in the market starts coming into play. One very high quality alternative publisher, Futuropolis, brought in some of the best talents from the fanzine world to be in a magazine. But just as that anthology magazine, LABO, premiered in 1990, Futuropolis imploded. (Small press and alternative publishers are typically more fragile than large publishers--one bad bet can bankrupt them.) So a group of cartoonists from LAPO banded together to form their own publishing collective called L'Association. And in terms of quality of work published, and in terms of the effect it had on the staid comics scene in France, L'Association was one of the most important events in the history of comics ever. It's so important that Beaty in essence gives it two chapters, one at the beginning and a chapter on one of the founding members, Lewis Trondheim, at the end. In terms of the tension between autonomous and heteronomous, L'Association exemplifies it. A non-profit press, it experimented with formats that were simply not used by the major publishers--for example, mini-comics, American-style comic books (saddle-stiched with a limited number of pages), and squarebound black-and-white paperbacks (similar in dimensions to literary journals or trade paperbacks in the U.S.). Their books also tended to be sold through a different network of stores than the more typical mass-market French albums (L'Association in particular depended on comics specialty shops.) But at the same time, these were mass-produced items made for sale as widely as possible. And the work managed to elevate several of its authors to wide success--Trondheim, Joann Sfar, and Marjane Satrapi. Many of its artists started doing work for more mainstream publishers, either with the publishers creating new lines to accomodate their work (and the work of artists from other countries who also worked in black and white), or by doing full-color 48-page albums--the standard classic mainstream format for Franco-Belgian comics. This caused friction between members, with J.C. Menu representing the purist wing. In 2005, Menu wrote a manefesto of sorts, Plates-Bandes, in which he decried much of the cross-pollination between mainstream and alternative. In particular, he worried that moves by large publishers would destroy L'Association by the creation of inferior imitations. It seems that Plates-Bandes expanded the rifts in L'Association, and subsequently, many of the founders left. Only Menu and Matt Konture remain. One problem with L'Association being an exemplar of this autonomous tendency of European comics is that they collectively don't really fit into Beaty's other dichotomy--between comics-as-literature versus comics-as-art. L'Association seems to me firmly in the comics-as-literature node. For one thing, the artists at l'Association mostly come out of the world of comics--fanzines, fandom, semi-professional work, etc. (This cannot be said about some of the other artists featured in Unpopular Culture.) But more important to my mind was their adaptation of OuLiPo to comics. OuLiPo is a group of writers who gathered together in the 60s with the intention of doing literary experiments that took the form of very precisely defined contraints. Perhaps the best known example of this is la disparition by Georges Perec, a novel written without the letter "e". 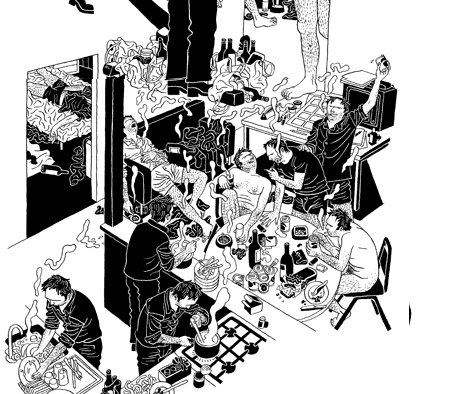 L'Association created OuBaPo (Ouvroir de Bande-dessinée Potentielle), which created similar constraints for creating experimental works of comics. The point is that L'Association came at comics from the same literary standpoint as previous French comics did, but with a more modernist and experimental bent. This is important because other publishers and artists really have approach comics from the point of view of visual art, both in Europe and the U.S. Curiously, few of them are from France. This approach seems mainly to belong to the Belgians, the Germans, and the Italians. The "fine arts" approach is best understood by seeing the work. German artist Anke Feuchtenberger is a perfect example. The key here is that all this comics tradition--all this inking--is utterly unimportant to Feuchtenberger. It's just not the world she comes from. Her world is the world of visual art. Indeed, she creates paintings and large scale drawings for exhibit in galleries. The same can be said for other artists Beaty includes. 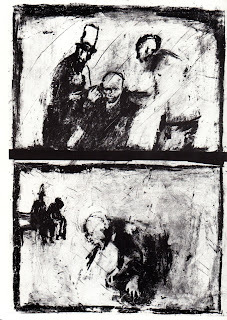 Vincent Fortemps working with atypical media (for comics) in his comic Cimes created an extremely painterly comic. The medium is greasepaint on acetate. 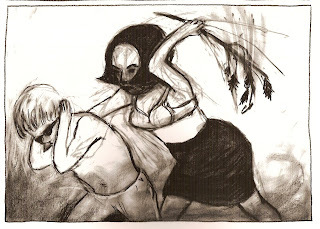 The work of the L'Association artists looks a lot more like what we expect from comics. This is not to suggest that they aren't innovative. Feast your eyes on this page by Killoffer. I could go on and on dazzling you with amazing artwork from European cartoonists. But that would get away from the point of this post--reviewing Unpopular Culture. Two more chapters deserve special mention. Since the publishers of these comics are small and typically underfinanced, and since they choose to exist outside of the mainstream comics world and the marketing apparatus that goes along with it, they have to have other ways of getting word out about their work. In the 90s, the comics festival became a key element of publicity for these publishers and artists. Comics conventions in the U.S. are primarily commercial events. Even ones devoted to alternative comics center around "dealers' rooms" where small-presses can find an eager clientele for their publications. To an extent, this is true in Europe, too--believe me, there are plenty of opportunities to buy stuff at Angouleme, the biggest comics festival in Europe. But the picture Beaty paints is of festivals where art exhibits are much more central than in the U.S. (Presumably this is because the festivals are subsidized, often by the host municipality, which makes the commercial aspect less necessary.) If your festivals are built around art, that benefits comics that put comics-as-art first. This is a thought-provoking book, and I recommend it to anyone who is interested in comics-as-art. Many of the artists Beaty discusses have work published in English which is well worth tracking down.